After another scintillating showing from Eden Hazard against West Ham on Monday night, Gonzalo Higuain could only acknowledge they may be seeing the last of him in a blue jersey. Chelsea took charge of the city derby, knocking over West Ham 2-0, but it was all built around the brilliant Belgian. His second that ultimately sealed the victory will be lost in the spectacle of the first. The dribble and finish is often a forgotten art, yet Hazard sent a reminder of how satisfying a deceptively simply skill can be. It was if the West Ham defenders had accepted their on fate as Chelsea's number 10 floated past the challenges, netting his 19th of the campaign at the end majestic manoeuvre. A man of the match award and a standing ovation was the least Hazard deserved after single-handedly deconstructing the Hammers from start to finish, the type of display that may soon sadly disappear from the Premier League. Hazard's three points projected Chelsea up into third place, above fellow London rivals Arsenal and Tottenham Hotspur, an unfathomable position from a few weeks previous when all seemed lost for the Blues. Champions League football has become a possibility once again, all thanks to one man who may face against them in the competition next year. There's no hiding the fact of Real Madrid's interest in Hazard's signature in the summer, or vice versa, and can they be blamed after his most recent rendition at the Bridge. Former Madridista and current Chelsea striker, Gonzalo Higuain, admitted the struggles of swaying his team mate to stay put. "What can I tell you? Those are things that involve the club executives and the desire of the player," Higuain told ESPN on his team-mates future. "When a player has a desire, it is difficult to change his mind." On loan from AC Milan, the Argentinian has had a frivolous time in front of goal whilst with the Blues (three in eight league appearances) but, like many, has purred over playing with the Belgian. He said, "He is one of the best [in the world], It is obvious that, when he is at this level, he gives you points, he gives you goals and the truth is that it is a great asset to have him with us." Hazard and Higuain have developed an instinctive partnership on the field, despite the latter arriving at Stamford Bridge in January. This was evident again against West Ham, Hazard setting up the forward on several occasions with suave and style, in particular a sumptuous one-two in the first half. 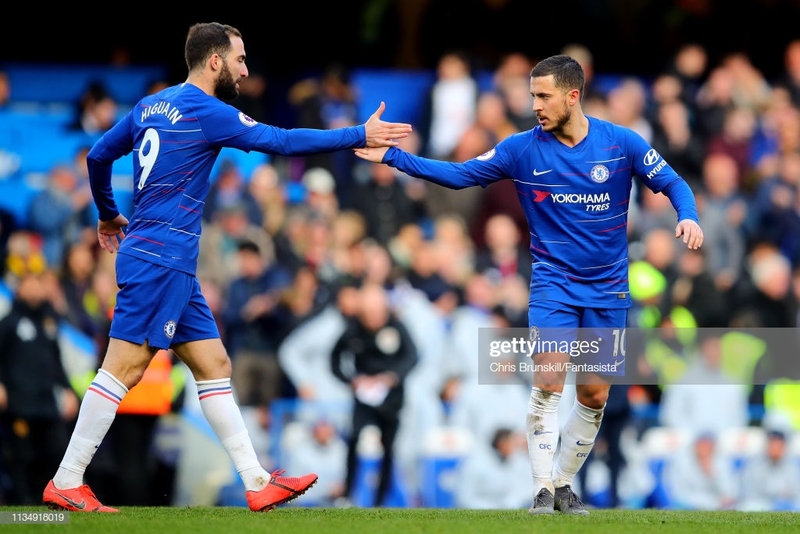 Aside from a pair of world class talents, a relationship off the field can be the catalyst of this equation and Higuain handed the Chelsea fans a slither of hope that Hazard might just stay put. "He has not asked me [about life in Madrid] but if it's what makes him happy, I wish him the best. I hope he can stay," said the 31-year-old, having played in Spain with Madrid for six years. If the players on the pitch revel on his ability, think what the man in the dugout must feel towards Hazard's presence. Maurizio Sarri's managerial career at Chelsea may well have been saved by the 28-year-old. He changed the complexation of the tie after coming from the bench at Cardiff City, scored against Brighton & Hove Albion and stole centre stage in his recent magic act. "Eden played a wonderful match. When he is able to play like this we are lucky because it is easy to win", Sarri told Sky Sports, after witnessing his West Ham demolition. The Italian's second term at the Bridge could come to fruition if he fortifies Chelsea's spot in the top four, plus there's the possibility of silverware in his maiden term, in the shape of the Europa League. He may commence another spell without his talisman in the squad however, saying, "If Eden wants another experience it's very difficult to keep him." "We are trying to improve. We are trying to become one of the best teams in England and, as a consequence, in Europe - but I think I have to respect his decision."